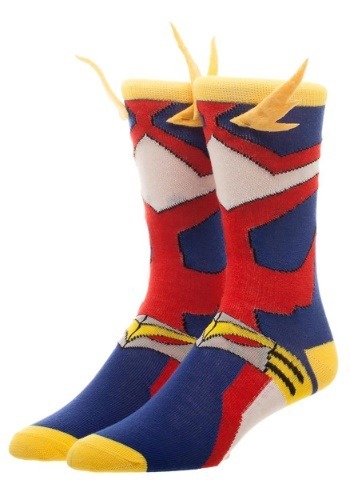 All-over knitted design w/ attached fabric "wings"
Not everyone can be like All Might. Those muscles, that hair, that outfit, and those poses… he was destined to be a true hero! We doubt that any mere mortal could even handle decking themselves out in the full get-up, even just for a minute. Perhaps if you wish to look like the My Hero Academia character, you need to start with something a little more subtle. Perhaps you should just start out with these socks, which are designed to make your feet feel super-powered! These My Hero Academia socks are officially licensed from the anime series. They have brilliant red, blue, and yellow colors and they even have bright yellow hair wings on the side, just like All Might. They’re made out of a spandex and polyester blend material, so they stretch to fit most sizes. It even has extra cushioning in the sole. And to top it all off, they’re machine washable, so when you’re done turning your feet into superheroes for a day, you can toss them in the laundry to get clean. Even if your current superpower is making the best English muffin pizza ever, you can still feel like a powerful hero when you wear these socks.